Forty Two Midgets Mutilated by a Lion in Cambodia Contest-Fiction! - Truth or Fiction? Forty Two Midgets Mutilated by a Lion in Cambodia Contest–Fiction! 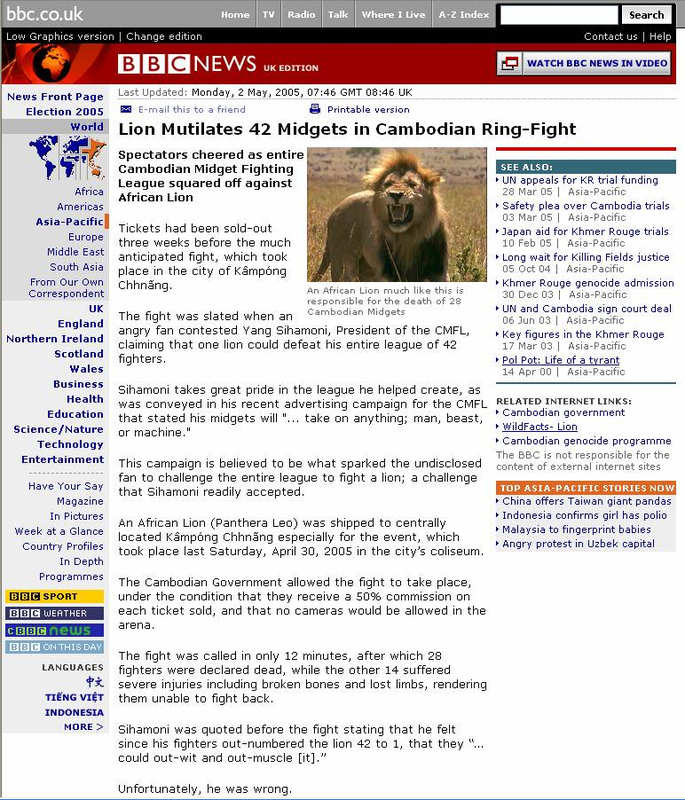 The story appears to be a BBC report about an alleged fight in a Cambodian arena between 42 midgets and an African lion. The story says that the midgets were of the Cambodian Midget Fighting League and that 28 of them died before the contest was halted. This circulated pretty quickly around the Internet during May, 2005, but it never really appeared on the BBC site because it was a hoax. The story was originally posted at http://lionvs40midgets.tripod.com. Later, the author posted an apology and an admission that it was a hoax. Tripod quickly shut the site down saying it violated its policies. He said he had given the link to the article to a small group of friends and never intended for it to spread beyond that, but it did. Andy Rooney's view of the world-Fiction!